LAT: 24:06, no errors. WSJ: 11:35, no errors. Like usual, I have no idea about the meta. Newsday: 18:19, no errors. We bombed on Thursday and Friday, after such a good start to the week. if I couldn’t fix it so that they would all get zero. Croce’s latest; 30:51, no errors; a relatively easy one! 20:11. I got the theme, but at first I assumed there was more to it. There wasn’t. I first put “NHL” instead of “AHL” for 13D. The NHL has a Calder Trophy that is essentially their “Rookie of the Year” award, but it’s indeed the AHL which has the Calder Cup. I only figured it out when I didn’t get the congratulatory banner at the end of the puzzle. Richard III’s line “my kingdom for a horse…” is often misunderstood as I understand it. He is not making a plea for a trade (as most believe) – i.e. he’d trade his kingdom if only he could get his hands on a horse. Rather, he is simply lamenting the fact that he’s losing his kingdom because he can’t get his hands on a horse. “I’m losing my kingdom for a horse?? Are you kidding me? ?” might be a modern way of putting it. It’s one of the few things I learned my second semester of my senior year of high school a.k.a. my senior slump…. NYT #0104 from my paper today. DNF ,I got about 90% but answers like refusenik and sabra did me in. Sometimes I wonder what world some of these constructors live in. Compared to my performance yesterday, this was a piece of cake. Not really very hard for a Fri., but I needed an easy one after flunking Thurs. I believe that Puerto Rico is a commonwealth not a territory. REALY good puzzle today lot of new questions loved it!! Untimed (online version didn’t turn the stopwatch on), but finished with no errors. Took a while to come into my own; I guesstimate 18 or 19 minutes or thereabouts. Nice Friday challenge, without getting out of hand on naticks or trickery. Took a bit of issue with the “clue” for SANS, without mentioning Fr.(ench). That was quite cynical. @John Daigle- I laughed out loud! Thanks for a good one! only getting like 3/4 each day. 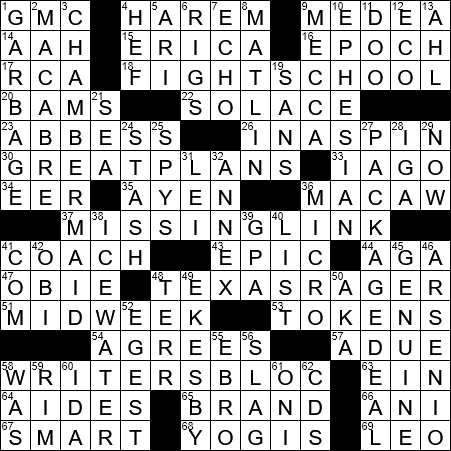 I do not like multiple word answers in a puzzle. I don’t know who started this, but I don’t care for them. Sorry, but otherwise I learn new words every day. I call it my brain work. Moderately difficult Friday for me; took 34:01 online with no peaking. Did have some trouble with the middle top section where I had edt before HEF and didn’t know who ERICA or MATLIN were. Thankfully crosses eventually came to the rescue. Jeff! It’s funny that you put NHL before AHL– I ALSO had NHL and when it didn’t work I thought “Jeff will know this one!” 🤗 BTW I am sure you’re right on that Shakespeare quote.